Figuring out how to simulate ground bounce, Vcc bounce, SSN, SSO (or whatever you want to call it) is not trivial. This is actually a shame, as it can very well be the most significant factor in your signal integrity analysis. This should be (and some day it will be) as easy as simulating reflections, crosstalk etc. But first let me explain what I mean by SSN (Simultaneous Switching Noise), as there are differing uses of the term. The basic premise is that we start with a very solid power distribution system (PDN), so there is a nice and sufficiently low impedance across the frequency range of interest. 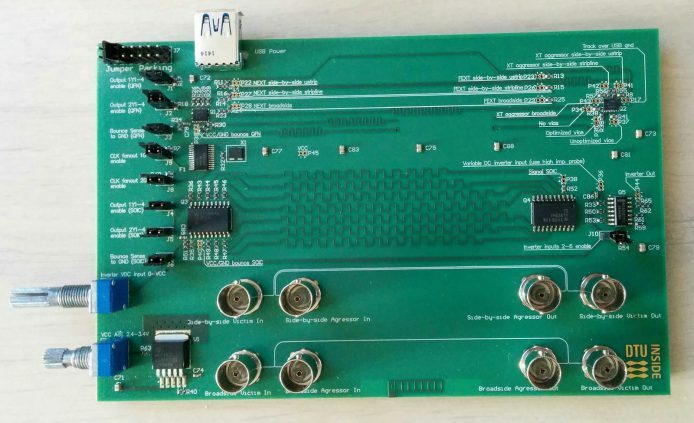 This is build up between two coupled planes in the board and this is where the IC connects through a set of vias (and maybe some BGA pad “dogbones”). Some want to include PDN effects in the SSN term, but I prefer to keep those terms separate. 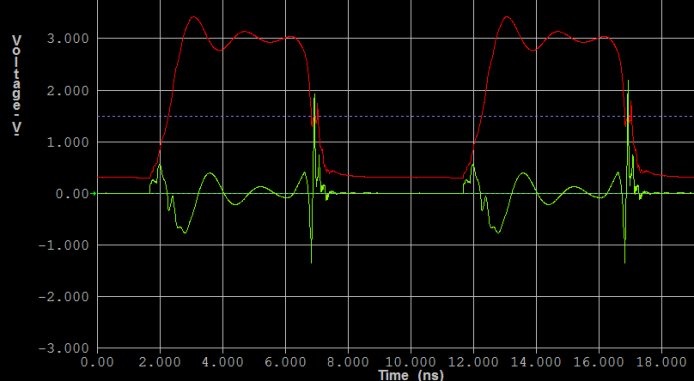 The top output driver is clocked at some frequency – the lower one (U1.16) is set to “stuck low”. Now what you you expect at the output of the lower one? Why is this wrong? Well because of SSN. The Vcc and Gnd connection between the IC pin and the die has some inductance – and across that inductance we will have a voltage whenever the current changes. This follows the simple formula: U = L * di/dt. 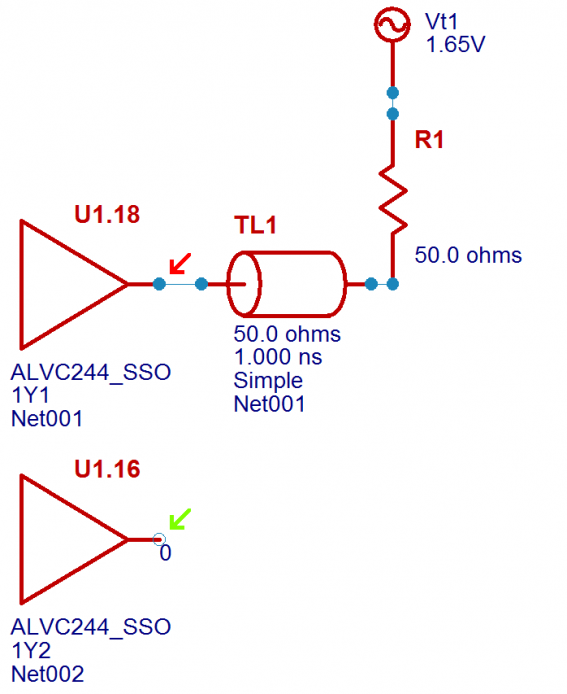 Whenever the output of the top driver output changes, some current will flow though the shared Vcc or Gnd connection of the IC. For the high-to-low edge of the U1.18 output, this current will run though the ground bond wire and IC pin and create a voltage difference between the ground pad on the die and the ground plane in the PCB. This is what I call ground bounce or SSN. Same but opposite for Vcc bounce. 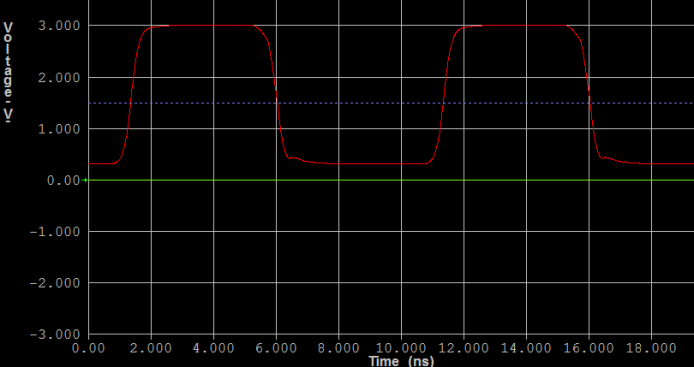 If we think of the simulators ground or 0V point as connected to the ground plane in the PCB, the “stuck-low” output of U1.16 should then show something different than a flat line at zero. This is a very simple IC (on purpose to keep confusion to a minimum) with only one power and one ground pin. So open the IBIS model file (which is just a plain text file) in a suitable editor and locate the pin section for the package of interest. Find the parasitic package induction: 6.35nH for Gnd and 6.31nH for Vcc in this case. You can also find the DC resistance and the parasitic capacitance. Make sure the 3rd column reads NC for the Vcc and Gnd pins. You may want to change the name of the IBIS file when you save it – but remember to change the file name reference in the file as well when you do that. This simple Spice circuit describes the two power pins and their associated bond wires – basically everything from pin to die. You can see it’s a crude description, but enough for many purposes – and this is all the information most IBIS files have. Lumped element R/L/C models for each pin. You can place this right after the pin assignments in the IBIS file. All it does is really connect the power rails of the two I/O cells for pin 16 and 18 to the two new nodes called pu_ref and pd_ref – and connect those two nodes to the Spice sub-circuit. That’s all. We are now ready to simulate the original simple schematic with the full SSN or Ground/Vcc-bounce effect. 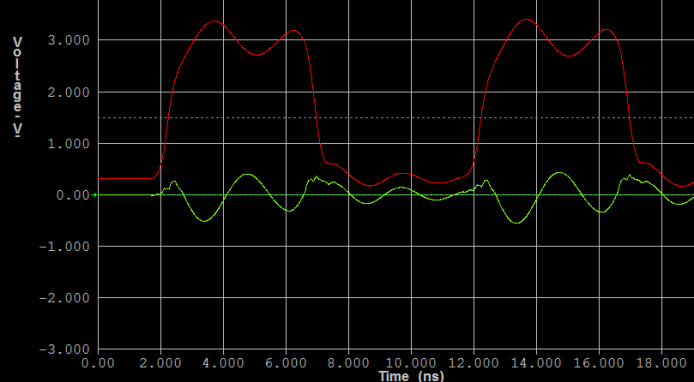 Notice the difference on the green curve (the “stuck low” output)? And the red curve is impacted quite a bit as well… Almost to the point where you question the validity of the simulation. And you should. So next step is to scrutinize the simulation setup – and verify with measurements. One of the things that can make this simulation come out like if the part is completely useless because of excessive SSN is the complete lack of die and package capacitance between power and ground. It is very difficult to imagine the die not having at least some capacitance between power and ground. Quite a dramatic effect. 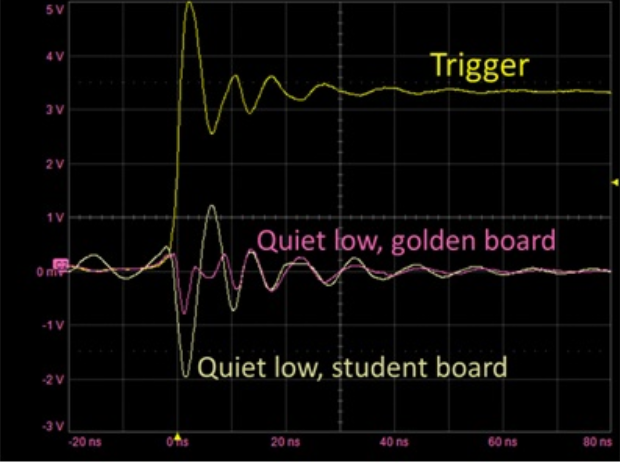 This shows how important on-die and on-package capacitance really is. And it also highlights how bad IBIS models are in predicting SSN at the current stage. How do you think it would look, if someone actually hooked this up on a board and did some measurements? Comment below. Disclaimer: This is written for Hyperlynx 9.1 – expect SSN simulations to get easier as tools and models evolve. This method is only useful for Hyperlynx – other IBIS simulators have different ways of doing this.